Avoid the delays and uncertainties of waiting until the last minute and begin this simple, uncomplicated application process today. According to the New York Times “Space is rapidly running out in the hallowed National Cemeteries like Arlington that are the final resting place of so many who have served their country so well.” Download this free, detailed guide to satisfying the full eligibility requirements and applying successfully for National Cemetery burial benefits. Every veteran is guaranteed a gravesite in a National Cemetery, as are (with some restrictions) veterans family members as well as many who have served their country in non-military roles such as the Public Health Service and the WWII Merchant Marine. 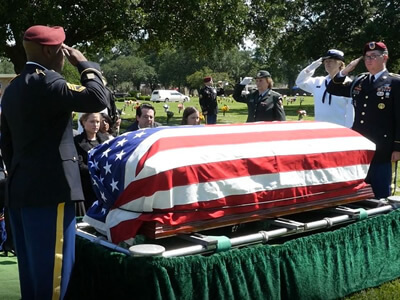 However, with space running out at the most well-known and visible National Cemeteries, increasingly veterans and other eligible people who wait until the last minute to apply are going to have to settle for burial in beautiful but remote places like Sitka, Alaska or Kerrville, Texas. While applying early doesn’t reserve a particular National Cemetery or gravesite, it does jumpstart the process of final cemetery/gravesite assignment that begins the moment that the VA is notified of the eligible person’s death. If you are looking to reserve your space in a National Cemetery fill out this form to download our FREE National Cemetery Burial Guide and receive more information from one of our trusted funeral directors.